It is a good book for young readers who are learning to read. I liked Meg who saved the roman who was being bitten by a crab. The history of the book wasn't very good because it didn't really say anything about but is simply a story about a Roman trying to get to Londinium, however I was interested to look at the other available books on the back cover of the book. I thought it was a really good book especially for children and these authors were very funny. I liked Meg because she was quite adventurous however, I don't think this book was very realistic. I would definitely like to learn more about Roman history because I learned that the Romans were quite cool. This story is good. I really liked finding out that the Romans built and named London when I discussed the book with my Mummy. I liked the Latin. I think this is a book for five and six year olds. Meg meets a Roman and brings him back to London. I would recommend this because it teaches you some Latin. This story is about a girl called Meg who brings a Roman to London. I think it is good for five or six year olds and I would recommend it because it is great! This is a book about a witch who meets a Roman. The Roman takes the witch to London. It would be suit five or six year olds and I would recommend it because people will like it. The book was very amusing, but Ii think girls a bit younger than me would enjoy it more. I thought Mog was very funny and Julius was hilarious and very confused. I enjoyed the way Meg put a spell on Julius to make him proceed back to Londium. Now I've read this book it really made me want to learn more about the Romans and Latin. I would love to read more books by Jan Pienkowski. I think the pictures are lovely. I am going to tell my friends to tell their younger sisters and brothers about Meg and the Romans. This book was a very interesting. It gave an insight to the life of Romans which I enjoyed because I like history but it was done in a fun way. The illustrations are amazing. This book will be very good for younger readers but even as an 10 year old I enjoyed this book because it was a short read and funny. 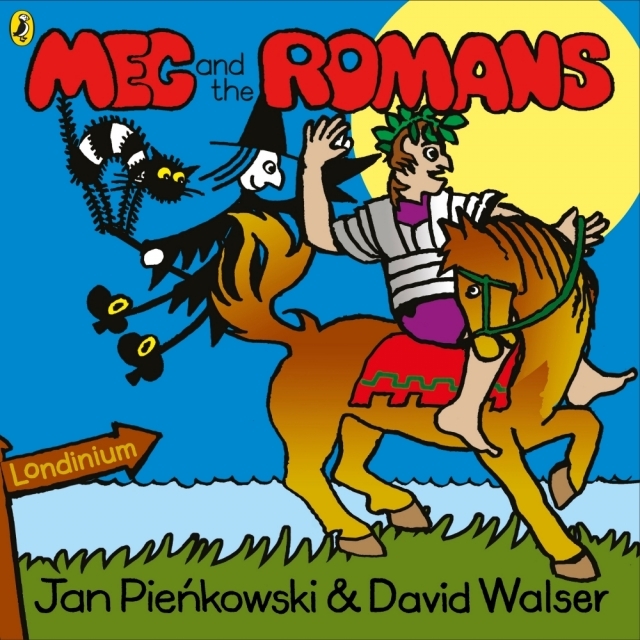 The story is about a Roman who meets meg and they need to get to Londinium ( London) but he gets bitten by a crab and can't walk so Meg sets out to help him. I think this book is good because I like Romans and find them interesting. I also like this books because it shows you the type of things that Romans would use. My favourite part of the book was when the cat and the owl were trying to figure out what Romans were. They time travelled to when the Romans lived and helped one of the Romans get back to London. I enjoyed this story because I liked learning Roman language called Latin. It made me want to learn more about the Romans. I liked the character Julius because he had more colour then Meg and Mog and I like colour. I like the book because I like the way it was set out and there were lots of pictures. My favourite character is Meg because I am familiar with the character as I've read a lot of Meg books. I learnt through the book that the Romans spoke a different languageÂ called Latin, I thought they had spoken English. I would give it 10/10. I enjoyed this story because I liked learning Latin. It made me want to get more into the Roman language. I liked the character Julius because he speaks Latin. I'd recommend it to my friends and give it 9/10. In Robins we read the book as a whole class and we loved the story and the illustrations. We think that the book could be improved if there was a map of photographs of real artefacts to help us to understand the time period. The illustrations in the story were good but at the end we did not know much more about the Romans than before. The book is about a witch called Meg and her adventure with a roman called Julius. Meg is with a cat called Mog and her owl. The roman wants to go to Londoninum so he asks Meg the witch. They do some spells but it goes all wrong. Finally they all end up in Londonium. They all go on a picnic where they discover a crab. Meg goes home and shows the importance of having a home. I liked that the book was very funny and made me laugh. My favourite part was that the crab nips Julius' toe. It was really funny. My favourite character was Mog because she looked really cute in the illustrations. I think children would like this book at the age of four- eight years old. I liked the pictures and liked the way the writing was in speech bubbles and added humour to the story. I learnt that London used to be called Londonium and Britain was Brittania. Also, I learnt that if you try hard then you will achieve your target. Meg, mog and her owl go on a journey where they meet a roman called Julius who wants to go to londonium and make a picnic where they find a crab that nips Julius's toe that makes it go pink then they do a spell that goes wrong but then they get to Londoninum and saves Julius from going into a pond by casting a spell then they come back home. Our favourite part is when Julius the roman is about to fall in the pond and sink. The characters are meg, mog, the owl, the golden eagle Julius and his horse. Children 1 to 6 would enjoy this book because it is humorous; I learnt that London was called a long time ago, Londonium and Britain was called Britannia. My favourite character is dobbin the horse. I rate the book 4 out of 5. I liked the books a bit and from the point of view of a small child I think they would love it because of all of the bright coloured pictures and short worded pages. I also think they would like Mog the cat because they would want an animal in the story; both other readers and I like the idea of Dobbin the horse and when Dobbin throws Julius off the horse. I don't think it was realistic at all but I think some people would learn a bit about the Romans and there language from the book. My book review is about Meg and the Romans. I loved this book because it is adventures also Meg and Mog met up with the romans. My favourite charter was Julius because he had a pet eagle and the eagle was yellow, orange and brown. This book would be recommended for one year old and over. This book made me read more of his books. I can remember reading Meg and Mog when I was little. They are a bit strange as they don't have full detailed sentences sometimes. It was fun to read it though. I have a little sister and I would read it to her and I think she would like it. I would like to read it to her so I could explain about the Romans.